MIT is the abbreviation for Massachusetts Institute of Technology. The last decade of the 20th century had given a lot of trouble to Las Vegas casinos as a group of former MIT students took away lots of casino money http://clubvulcan777.org. MIT Blackjack Team consisted from the mathematicians and engineers who used card counting system to beat casinos in 1990’s. They did not use any blackjack cheating software for that. These students used basic strategy and all card counting systems which were described in books before. By the way, Edward O. Thorp, the author of the legendary book Beat the Dealer had been working at MIT since 1959 till 1961. Why have they decided to make a Blackjack Team? Actually, these students did not have any plans to beat casinos and were even afraid of making big bets while playing blackjack. 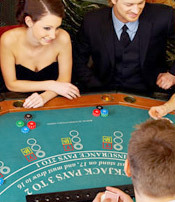 Moreover, they had no interest in card counting system. They just liked this game and often gathered after classes to play it. But why not to make money from what you like much? The beginning of 1990’s was a year of MIT Blackjack Team’s birth. But they were “born” not only like a team but also like people who decided to use blackjack cards counting system for winning much money. As we already know, the members of this team were mainly MIT students. Well, first they were students of course but till the time they’d become real card counters they had graduated and become professional mathematicians and engineers. They found new students who would like to join them and taught card counting systems to those students. They trained a lot, thought over many blackjack variations, tried a game with up to eight blackjack decks etc. How could they win so quickly? One person was a spotter. He just counted cards and did not make big bets, just minimum ones. When the count was favorable he gave a signal to other team’s members to join the game. The second person of the team called “gorilla” and his job was just sitting and taking a part in the game. When he saw the signals of a spotter he came to the game and made bets. The last, third one, person could bet and count all together. His role was doing both of them. Such players were called big players and were very clever and respected by the team. They were real professional counters. 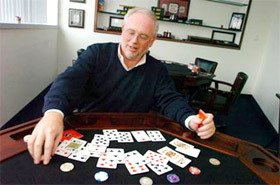 MIT Blackjack team won a lot of money in 1990’s. Eventually, they were barred from casinos one by one. The team split in 1997. Some of them tried to make a career of public speakers and teachers of cards counting. Ben Mezrich wrote a book of stories which happened to the Team (later he confessed that only some of them were real, all other were fictions). The book became a bestseller and it was called Bringing Down the House. This book gave an idea for the film “21” which was released in 2008 and produced by Kevin Spacey.